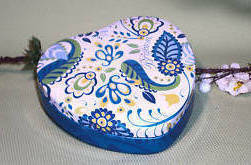 Brighton Designer Collectable Heart and Blue Paisley Jewelry Box Tin Measures 4 inches long x 1 inch deep. Perfect for holding any little thing or concealing a new gift inside a beautiful keepsake designer package! Pre-owned with no dents.